A movement has begun against the setting up of the Nano City in Panchkula, with an NGO Paani Foundation taking the lead. The foundation is headed by former agriculture officer H. S. Lohan and its co-founder is former chief hydrologist of Haryana R. C. Gupta. Quick to pounce on the alleged property dispute between two Congress MPs from Haryana, which led to the issue reaching the police in Sonepat district yesterday, the state unit of the BJP today fished in troubled waters urging for a high-level probe in the issue. They come easy, cheap and without hassle by the dozens. The menace of child labour, thriving in urban pockets heedless of the ban, continues to be fuelled by business-minded shopkeepers and an indifferent public. Taking up a petition for directions to the State of Haryana for quashing order dated November 20 fixing "state advised prices" (SAP) for sugarcane for 2007-2008, a Division Bench of the Punjab and Haryana High Court today ruled that the fixation of SAP was subject to final decision in the matter. The Haryana government has ordered a probe into the controversy allegedly involving the removal of “fused kidneys” of a woman patient by a civil surgeon in Ambala and the inquiry is currently pending with the “specialist committee” of Rohtak’s Post Graduate Institute of Medical Sciences. Had it not been for a mercy petition filed to the President of India, today’s sunrise could well have been the last one for Sonia and Sanjiv, who are on death sentence at the Ambala Central Jail. 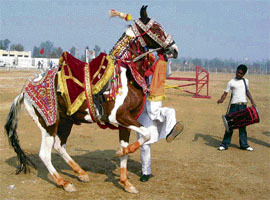 A mare made to dance to dhol beats at a horse show held at the equine research facility in Hisar on Monday. — Tribune photo by P.L. Munday. Former Chief Minister and INLD president Om Prakash Chautala today here blamed the Uttar Pradesh government for its non-seriousness to tackle the blast issue that rocked the state on Friday. He said the blasts in Uttar Pradesh had highlighted the weakness of the UP government to deal with terrorists. There was no need of special act like POTA to control such terrorist activities. However, there was an urgent need to make the state police more responsible and accountable, he added. In a major break through, the police has arrested two persons today in a case of cheating and criminal breach of trust and conspiracy after they were allegedly found responsible for opening the seal of MBA, MPhil and MA papers of Periyar University, Tamil Nadu, to be held in a private school here. Haryana Agricultural University will offer guidance to the Bill and Melinda Gates Foundation to devise a strategy to accelerate the pace of agricultural development in Asia and Africa on the pattern of European countries. Paddy growers in the belt are a happy lot, thanks to the handsome returns from 1121 variety of rice that had been grown by them on a large scale, instead of the traditional variety - parmal. The state government has released a sum of Rs 12 crore for 120 villages of the district under the Local Area Development Tax (LADT) scheme. The police claims to have zeroed in on the culprits and hopes to unravel the mystery surrounding the murder of a trader soon at Bhuna town in this district. The police today arrested three persons responsible for attacking and looting two Japanese nationals, Kazawa Takoya and Onodera. Vaish Senior Secondary School yesterday organised its annual prize distribution function on its playground. Chief guest Ram Niwas Agarwal gave away prizes to meritorious students. An annual day function of the Delhi Public School (DPS), Jaunawas, was held here last evening. Following the orders of the Haryana government for declaring the more than two and a half month old lockout of the Toy and Toy industrial unit, hundreds of women workers of the unit led by state convener Shradha Nand Solanki, Haryana Kisan Sabha, staged a protest rally today. They handed over a memorandum to deputy commissioner DPS Nagal, asking for issuing directions to the unit owner to end the lockout. As many as two persons were killed, while one sustained serious injuries in separate road accidents in the district in the past 24 hours. Kurukshetra University vice-chancellor, Prof R.P. Hooda’s name was today cleared for the post of vice-chancellor of Maharishi Dayanand University, Rohtak, here today. The approval was given by Haryana Governor Dr A.R. 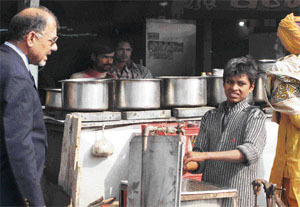 Kidwai, who is also the chancellor of the university. He has been asked to take over the reigns of MDU from December 4, this year. Though his appointment marks the end of the race for the post of MDU V-C, it also means the beginning of a new race for the vice-chancellorship of Kurukshetra University, Kurukshetra, which falls vacant. Prof Hooda, considered close to Chief Minister Bhupinder Singh Hooda, was the top runner for the post for which the screening committee comprising Prof Bheem Singh Dahiya, former KU VC, R.P. Vajpaee and secretary, education, Rajan Gupta, had finalised a three-name panel which had been sent to the Haryana Raj Bhawan for the Governor’s approval. Since the Governor is in Delhi presently, the approval was given in Delhi. A number of changes was introduced by Prof Hooda at KU during his over two-year stint on the campus, where he had studied in the capacity of a student and served as a teacher and an administrator. During his term, the university was equipped with a state-of-the-art computer lab with 200 internet connectivity notes and CD-ROM device with a view to lending vigour to both academics and research, the university adopted a plan to standardise its research programmes. Further, the university added some very useful new-age programmes of study, particularly in the field of bio-sciences, bio-technology, pharmaceutical sciences, and geophysics in line with the newly emerging needs of industry and market economy. Adequately aware of its increasing social responsibility, the university sought to adopt a holistic approach to academic growth. The students welfare department introduced a programme of skill and personality development of the students. Similarly, the youth and cultural affairs department engaged the students in all kinds of cultural activities for their all-round development. A plan to prepare a few short documentaries for educating people in rural areas, about the vices of female foeticide, dowry practices and other social evils was also underway. A movement has begun against the setting up of the Nano City in Panchkula, with an NGO Paani Foundation taking the lead. The foundation is headed by former agriculture officer H. S. Lohan and its co-founder is former chief hydrologist of Haryana R. C. Gupta. It has started the movement against the acquisition of land for the Nano City in collaboration with the Shivalik Area Sangharsh Samiti, a body of local farmers. The foundation has started the movement by organising small meetings addressed by land preservation activists. A meeting was organised at Raipur Rani yesterday, which was addressed by renowned land preservation activist Devender Sharma. He advised farmers not to sell their land. Instead, they should continue farming them and reduce their cost of cultivation by following organic farming. The yield would be same as they would get from modern farming. Chemical fertilisers and pesticides killed earthworms and friendly insects. Sharma said special economic zones (SEZ) and big project for which lands were being acquired, never produced enough as claimed when these projects were conceived. He cited the examples of the Haldia Petrochemicals Project in West Bengal and Mangalore in Karnataka. He said when the US farmers were getting Rs 1 crore subsidy daily then why Indian farmers could not get a regular support for farming from the government of at least Rs 10,000 per month per acre? He said the Indian farmers produce enough to feed the nation, provided proper price of their produce was paid to them. The farmers expressed the view that the Nano City Project should not be set up in this area. They were also agitated over “excessive” mining taking place in the area, which had not only spoiled the land, but had also affected the water resources. General secretary of the BJP Capt. Abhimanyu said the high-level probe should not only take development of Sonepat in its ambit, but should also get into details on the property purchased by relatives of Congress leaders after the party came to power in the state. With regard to the property dispute in Sonepat referred to by the BJP is a land measuring more than 500 acre in a village where the cost of land is about Rs 2-crore per acre. He said the dispute was just the tip of the ice-berg. In several parts of Haryana, including Gurgaon, Faridabad, Sonepat, Jhajhar, Panipat, Kundli and Bahadurgarh, land mafia was in league with the Congress governments in Haryana and the centre. In Haryana, plots have been allotted to those who are close to people in power. Congress leaders and their relatives here knew the details of the master plans that were being drafted for the cities. They purchased land at a low price. These master plans were also amended at a number of places to accommodate some vested interests, he added. Chautala said yesterday's clash in Delhi between men of the two Congress MPs, Naveen Jindal from Kurukshetra and Arvind Sharma from Karnal, over 550 acres in Sonepat had proved that the INLD allegations of the Congress government and its leaders indulging in property deals and large-scale corruption were true. The Delhi police had registered an FIR and arrested six persons over a property dispute between the two Congress MPs. Alleging that bigwigs of the Haryana Congress were looting the state in an organised manner, Chautala said. For the under-14 boys, employed for long hours in dhabas for a pittance, the only consolation comes from the regular meals they get and the satisfaction of having a roof over their heads. Beyond this, their life revolves around washing dirty dishes, sweeping, cutting vegetables and cleaning filthy tables. Ganja, alias Ajit Kumar, is just one such face in the crowd of many children working at dhabas along the National Highway-22 in Ambala. During an inspection by a four-member team of the Haryana Labour Department headed by deputy labour commissioner Pala Ram, Ganja was caught “red-handed”, working in a dhaba. On being asked his age, he claimed that he was 19 years, when he looked all of 12 years. The team which included labour officer C.L. Kalia, labour inspector Anjana and medical inspector Dr Sarabjit was accompanied by TNS during the first inspection being carried out as a part of the department’s enforcement drive against child labour concluding on November 30. If a random survey is anything to go by, every second dhaba employs children as was evident from today’s inspection. At another dhaba in the city, Shreepal and Rahul, claiming to be employed for just over three months, said they were over 17 years of age. The doctor accompanying the team pegged their age at 11 or 12 years. To this, one of the boys replied that he looked younger because of his short stature only. Similarly, Raj, Telu Ram, Vinod and many others were “caught” during today’s drive. While the dhaba-owners were educated about the penalty of Rs 10,000 to Rs 20,000 for employing children along with imprisonment of six months for violating the ban, the shocking part was that most of them were aware of the ban. To counter it, they had tutored little children, essentially from Bihar and Uttar Pradesh, to say they were above 14 years and stick to that. “We regularly undertake special exercises to create awareness about the ban on child labour but shopkeepers knowingly employ children unlawfully. After inspection, we submit our report to the head office which issues a notice to the shopkeeper in question after which the matter is taken up for hearing in the court of the ‘ilaqqua’ magistrate who announces the fine,” Kalia explained. While shopkeepers are threatened against employing children, for a while after the notices are served, everything returns to normal in due course of time. With inspections few and far between and with no place available to keep such “rescued” children, their fate remains unchanged. Left with the employer where they were found after the inspection, they are either shunted out of the place and pick up a job elsewhere or are made to lie low till the dust settles. Either way, they lose. The Bench, headed by Justice J. S. Khehar, also issued notice of motion to the State of Haryana and other respondents on a petition by Saraswati Sugar Mills Limited, Yamunanagar. The case would now come up for hearing on December 6. The petitioner prayed that directions should be issued to the state for refraining it from discriminating between the cooperative sugar factories under their control and those in the private sector in the matter of grant of financial and subsidy. It was asserted that state governments like Maharashtra, Karnataka, Andhra Pradesh have come out with relief and subsidy package for sugar factories. However, the State of Haryana has given relief to only cooperative sector factories. The petitioner claimed that currently there were no rules or methodology for fixing SAP and the executive was free to exercise power in an unbridled and arbitrary manner. Giving details, the petitioner contended that sugar prices, ranging between Rs 1700 and Rs 1800 during 2005-06, started declining from free sale price of Rs 1617in October 2006 which was the beginning of the season. Though production cost rose by about 10 per cent, the state of Haryana fixed an exorbitant SAP. The petition added that for the season 2007-08, the projected breakeven paying capacity of the mill without any profit came to Rs 101 per quintal of sugarcane, which was far below the SAP fixed by the state government. The petitioner said despite steep fall in sugar price from high of Rs 1800 in 2005-06 to Rs 1200 in September 2007, the State of Haryana has fixed same price for sugarcane for 2007-08 as in the year 2006-07. Stating this on behalf of Haryana and the director-general health services, civil surgeon at Ambala city Civil Hospital Dr V.K. Sharma has asserted in his reply before the Punjab and Haryana High Court that the respondents were not liable to pay compensation during the pendency of the inquiry. He has further stated that the court may direct Chandigarh PGIMER, where the patient is admitted, to provide free treatment to Kanta Devi during the pendency of the inquiry as Haryana was extending grant-in-aid to the institute here. He also asserted that Dr Sudhir Kumar conducted renal surgery in accordance with “the best of his knowledge and capability”. In the current matter, public interest litigation was not maintainable as it pertained to an individual. A Division Bench of the high court, comprising Chief Justice Vijender Jain and Justice Mahesh Grover, had on the last date of hearing had directed that there should be no let up in the treatment, while taking up the matter filed by the Lawyers for Social Actions. The petition had sought payment of adequate amount for renal surgery to Kanta Devi, who had lost her kidneys and was now fighting for her life at the PGI, Chandigarh, due to negligence and misdemeanor on the part of Dr Sudhir Kapoor. Seeking action against the surgeon concerned, the petitioner had added that directions should also be given to the authorities to pay a compensation of at least Rs 10 lakh for ‘gross negligence’ on the part of hospital authorities. Going into background, the petitioner had stated that on October 20, the surgeon had removed both her kidneys, despite a CT scan report that they were fused together. She was later taken to the PGI and required immediately Rs 2.50 lakh for medical surgery and other expenses. The Supreme Court had ordered the death sentence for Sonia and her husband, Sanjiv, for the murder of eight family members, including former MLA Relu Ram Punia. The death sentence was to be carried out today. However, the couple recently filed the mercy petition with the President, following which their appeal is now pending. Sonia is lodged in a solitary cell in the female block, while Sanjiv is lodged in another solitary cell. Both of them have restricted movements and they have to be under solitary confinement, since they are facing death sentence. A jail official explained that the couple could not leave their respective jail blocks. Even if some medical requirement arose, then the doctor had to visit their block. They were not allowed to leave their block under any circumstance. According to the jail manual, the warder on duty over a condemned prisoner shall be armed with a baton and provided with a rattle to give alarm when necessary. He shall be posted in or immediately outside the door of the cell yard and shall keep the prisoner constantly in view. The keys of the cell in which the condemned prisoner is confined, shall be kept by the head warder on duty, who on hearing the alarm shall proceed to search the cell. Chautala, who along with other members of the United National Progressive Alliance (UNPA) yesterday visited blast sites in UP said, “The affected people at Varanasi told us that the police reached at the blast site after six hours after the incident. This reflected the non-seriousness of the government to deal with such serious issues”. Commenting on the UNPA’s stand on the nuclear deal with the USA while addressing press conference in the evening, he said UNPA members yesterday held a meeting and it was decided that there should be a national debate on the nuclear-deal issue. The accused, Anil Dhanuka, a city-based owner of a private institute, and B. Arangnathan, a lecturer of bio-chemistry from Tamil Nadu, were held under Sections 420, 409 and 120B of the IPC. As many as 526 students from the district and others have suffered harassment, who came here to appear for the exams, at the examination centre in the Swami Dayanand High School, MC colony here. The police said the incident came to light when principal of the school Sunita Sehgal, who was also superintendent of the examination centre, highlighted the issue of open seal of the packets carrying papers brought at the centre. When she enquired from lecturer Aranganathan, who brought the papers from Tamil Nadu, he told her that Anil had opened the seal of the packet. She then reported the matter to the police. Acting on the principal’s complaint, the two have been arrested. HAU vice-chancellor J. C. Katyal said here today that real-time technology based on community needs would be passed on to farmers, animal breeders, unemployed rural youths and all those involved in the development of agriculture through hands-on training programmes. Michigan State University of America will be the main centre for its implementation, while Haryana Agricultural University will help implementing the project in South Asia. Katyal, who recently attended the Cornell International Symposium on Agricultural Information on invitation from the Bill and Melinda Gates Foundation, presented a detailed report on role of women in the development of Indian agricultural sector. In his report, Katyal highlighted history of extension system in India, food grain production, health and safety issues of women in agriculture, state of women workforce, stress points of extension system and long-term vision of a new extension model. The foundation representatives agreed to fund creation of a new model of the agricultural information. Katyal said the new system of agricultural information to be implemented within next three to five years would put Haryana’s agriculture on the world map. The total arrival of the paddy in the local market has touched six lakh quintals this season, so far, against the total arrival of 7.5 lakh quintals last year. 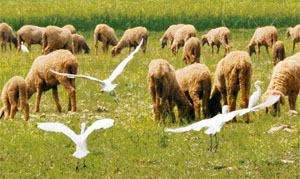 The total income of the paddy grower has grown at least three times this season due to the adoption of the new variety. This had been despite the fact that the work of procurement had been halted for about a week due to the strike about a month back. Expressing happiness and satisfaction over the return from the sale of the paddy this year, Surender, a farmer of a nearby village, said a majority of the farmers in the area had gone for cropping of 1121 variety this season instead of the traditional parmal variety due to the fact that 1121 had fetched them attractive rates ranging between Rs 1,800 to Rs 2,200 per quintal, against the MSP of Rs 725 to Rs 750 fetched by the parmal variety, which was mainly procured by the government agencies. He said the farmers had to even go for distress sale in the past years due to lack of proper demand and the dependability of the growers on the government agencies for the procurement. He said it was nearly a three-time rise in the overall return and a majority of growers had been satisfied, though the per-acre production of 1121 was lower than that of the parmal. The variety, 1121 had been a favourite item of the mill owners and private buyers, who normally procured it to meet the demand of exports, said a commission agent in the local market. Traders and exporters in the region and the state had gone on a strike after the union government had announced a ban on the export of the 1121 variety. But the ban was lifted after a few days due to protest by both traders and the farmers. Claiming that the new varieties, including the 1121 and the Mucchal one had changed the concept of the farmers towards the paddy cropping, Kishan Singh, a resident of a village in Safidon subdivision, said the results of the change had been visible this year and it was perhaps for the first time in many years that the paddy had yielded a good return in view of the fact that there was a constant rise in the production cost. But he admitted that this could have an adverse affect on the watertable as the farmers mainly depended on tubewell water for irrigation and the paddy required a lot of it. The total arrival of the 1121 was about 1.10 lakh quintal last year, while it has gone up to 2.85 lakh quintal this season, so far, according to Shyam Sunder, secretary, market committee, here. He said while the average daily arrival these days had been between 10,000 and 12,000 quintal, it had gone up to a maximum of 20,000 quintal this season. The procurement is likely to continue till mid-December. This development had also doubled up the annual lease rate of the land in the area, he added. Deputy commissioner Chander Prakash said the amount would be spent on the construction of peripheral roads and other chief streets with cement and concrete in the villages. Besides, the repair work of 63 chaupals for Dalits and Backward Class communities in various other villages of the district was also in progress. The work was being executed with funds provided by the Haryana Rural Development Fund Administration Board, he added. The police has rounded up one person in this connection, and claims that the mystery will be unfolded in a day or two. Trader Jhanda Ram Kamboj, a commission agent in the Bhuna grain market and a local leader of the BJP, was found murdered in his fields under mysterious circumstances on November 22. His body bore bullet injuries, and names of his partners were found written with a pen on his hand. Interestingly, Jai Gopal, one of his partners, was also found injured with bullet injuries on the same night at a separate place and the names of other partners were written on his hand too. The deceased had purchased some agriculture land jointly with his three other partners, including Gopal, and there was some dispute between the partners over the sale of the land. The police had rounded up some persons in this connection during the last four days, but could not reach any conclusion. Kin of the deceased and local traders were becoming restive and they had threatened to block the Fatehabad-Chandigarh road today if the police failed to unfold the mystery of murder. DSP Satbir Singh said the police had already arrested one person in this case and some other persons involved in the crime would also be arrested soon. The accused, Amit, Pawan and Anand, had assaulted the victims and took away their passports, international driving licence and a mobile phone on November 2. A special team has been constituted to nab the culprits. A science and drawing exhibition drew the attention of guests. In his address, Agarwal appreciated students who did well in various fields like education and sports. Hari Charan Garg presided over the function. Principal S.N. Mehta read out the progress report and sportsmen who brought laurels to the school at the national and international levels were honoured. Former minister Ram Bhajan Agarwal, Gauri Shankar Bajaj and Ratan Lal Chaukhani were among those present on the occasion. Students presented a colourful programme, comprising qawwali, dance and French song. The highlight of the programme was the group dance presented by mothers of the school children. Chief guest of the function A. S. Dulat, former secretary of RAW, Government of India, distributed prizes to meritorious students. Somany Vidyapeeth Public School, Masani, celebrated the annual day here yesterday. A cultural programme was presented by school children. Dhanpat Singh, director of Haryana Dairy Development Co-operative Federation Ltd., chief guest of the function, gave away prizes to students. Principal Archana Kaushik highlighted the achievements of the school in her annual report. Solanki informed that after the lockout of the unit, an inquiry was conducted by the deputy labour commissioner and the report of the inquiry was submitted to the labour commissioner. Despite several meetings with unit representatives, the lockout was not ended and the government declared the lockout illegal under the Industrial Dispute Act. Yogender Yadav (19) of Karoli village died, while Sandeep Yadav was seriously injured when their motorcycle was hit by a jeep on the Kosli-Karoli road last night. The mishap reportedly occurred when they were returning to Karoli. In another incident, Bhola Nath of Allahabad, UP, was crushed to death by a Rajasthan Roadways bus on the Delhi-Jaipur highway, near Bhoodla village yesterday. Cases have been registered against the drivers of rash driving.